Maximise fun and thrills on your Hen Weekend in Scotland with Quad Biking! 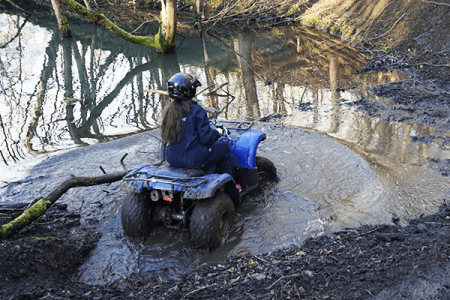 Our Quad Biking course in Edinburgh is set in 50-acres of magnificant woodlands and countryside, which will provide you with an adventure to remember! There is a maximum limit of 150kg (16.5 stone) for Quad Biking activities. If you think you are up to the test why not book our Extreme Quad Biking course? “We went here for part of my hen do and it was AMAZING! We did sumo, gladiators and quad biking and we all really enjoyed our day. Rab and James were so good with us, they were so patient as some of us were pretty s**t at the quads but they still managed to make it great fun for us all. I can't recommend this place enough!"